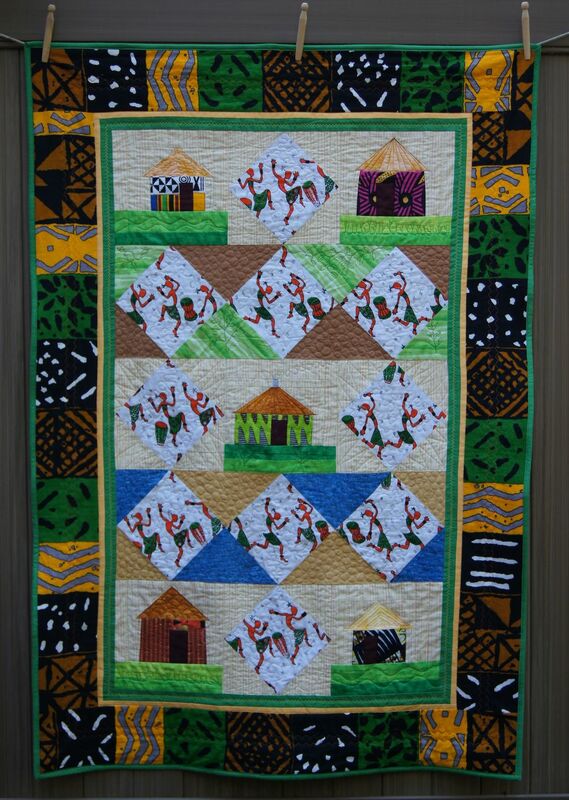 I've completed my African Village Quilt with all diamond blocks. The dancers in the diamond blocks, the bodies of the houses and the borders are all African Fabrics, or African designed fabrics made in Holland. 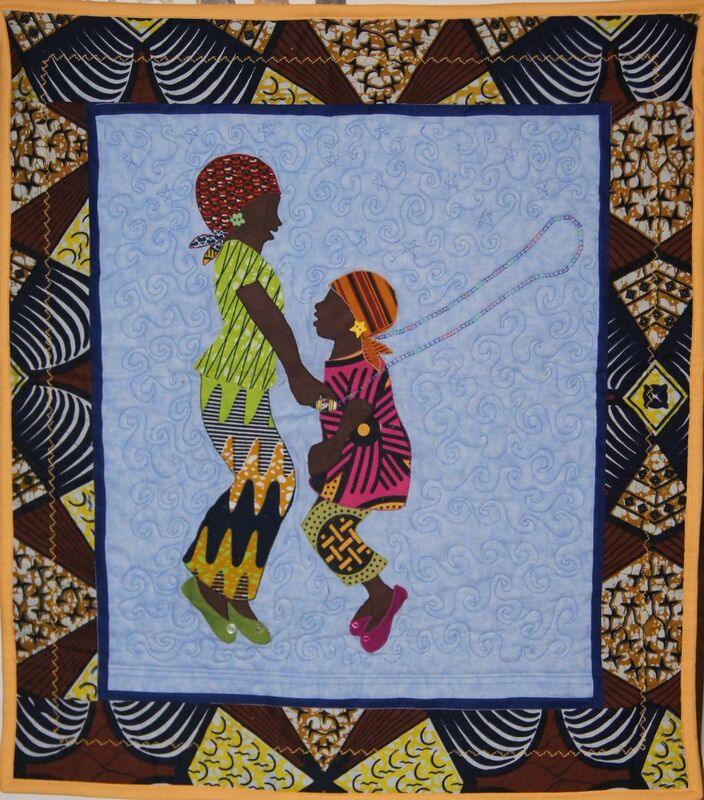 The border fabric is mud cloth made in Gambia. It is soft and gauzy. It worked well in the borders but the wax fabrics are easier to use for piecing since they have less give. Because the African fabrics were all so different, I washed them before I used them. The wax fabrics were really waxy prior to washing but soft afterwards. 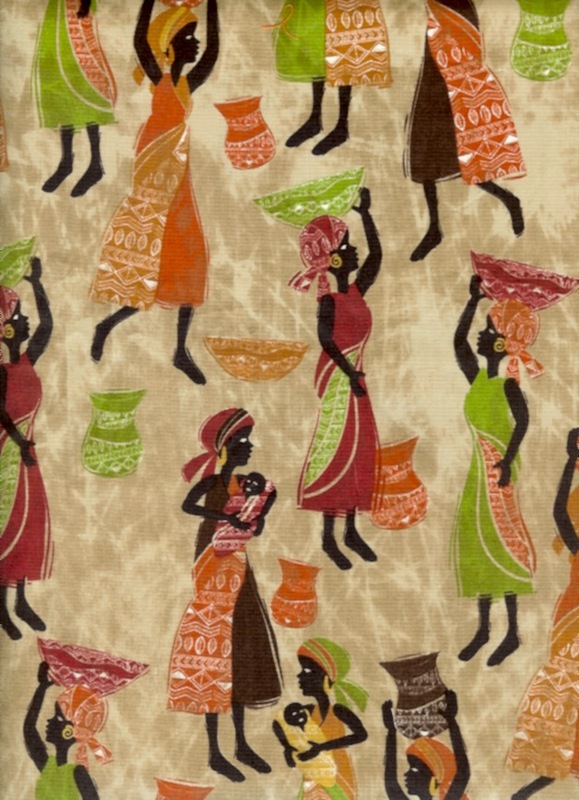 I found these fabrics at the Etsy shop, Tambo Collection. They had a great selection of fabrics and the prices are reasonable. Here is the back of the quilt. The central fabric is Kente cloth made in made in Holland. The tops and bottom strips are Kona Cotton "Cheddar"! I really like the motion in the Kente Cloth print. It's great designing. 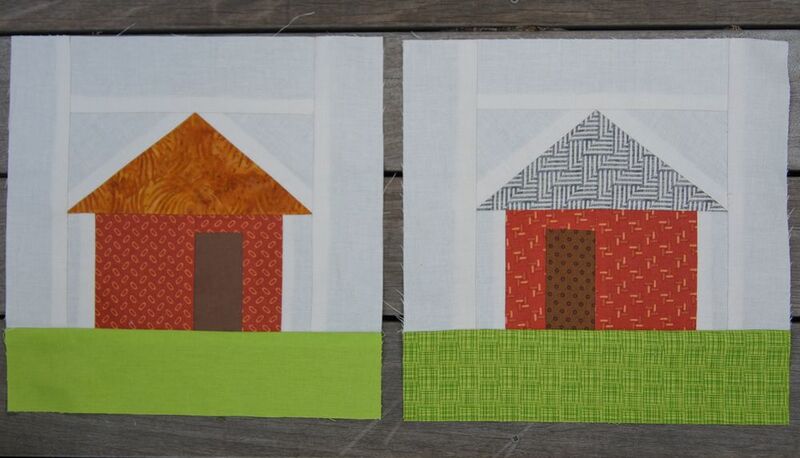 If you compare the photo of the quilt above with the pattern diagram below, you'll see that the quilt has 2 layers of "lawn" below the huts while there is only 1 in the pattern. When I printed the PDFs paper piecing files, I didn't change the print specifications to 100% which is necessary to get an accurate pattern. I had 1 inch markers on the patterns but didn't check them since they were my own patterns. I would have caught my error if I had put a ruler on the inch marker. The pattern on file is accurate but the printing wasn't. My hut blocks came out 8 inch finished instead of the needed 9 inch. When I was sewing the huts, they didn't seem any different than the huts on the first quilt I made. But they were slightly smaller. When I tried to sew the blocks together, they didn't match. I decided was easier to add to the hut blocks to make them larger rather than re-making the diamond blocks smaller. All the paper pieced patterns I've used from other designers have always specified printing at 100% which I've done. And I checked the 1 inch mark too. I've always wondered if it really matters. And the answer is: YES, it does! When I went back and printed one of the hut patterns with the print setting at 100% and the block measured a perfect 9 inch finished. Lesson learned. The top of the African Village Quilt is done! Great job. Now it's time to make the back. I had left over triangles from the setting blocks and corner blocks from the diamond strips on the front of the quilt. I also had some triangles which I cut for the quilt and then decided that I liked other fabric better. So I decided to make a strip back for my quilt. You will need a backing that measures at least 48 x 65 inches. This will give you a 3 1/2-4 inch overhang. If you plan to send it out to a long-arm quilter you may need it a bit larger. I used fabrics for the strips that are in the quilt top and I varied the width of the solid color strips to make the back more interesting. I also made a few more half square triangles for the strips. You'll note in the photo above that the half square triangle strips were extended with a piece of background fabric. If you wanted to, you could just use a couple left over half square triangles and make the strip long enough with other fabrics. However you do it, it's all good! I really like this back. It could stand on it's own as a quilt in its own right! Once you finish the backing, layer sandwich your quilt with top, quilt batting and the bottom. I used a cotton baby quilt batting which measured 46 x 60 inches. Quilt as desired or send it out to your favorite quilter! Add a binding once it is all quilted. And finally make a label. Here is my label before I wrote on it. I used some selvages from the fabric in the quilt along with a strip from my focus fabric. It adds a bit more information about the quilt and it's fun! Please leave me a comment to let me know how you are doing!